KINGSTON, JAMAICA | MAY 22, 2013 | True Gift Entertainment/Starkutt Records recording artiste Demarco continues to break new ground with summer fast approaching. The Dancehall superstar over the weekend created history by becoming the first Dancehall act to be featured on the cover of an Arabian Magazine. The ‘Continue Whine’ singer is featured on the cover and in a four page spread of the May - June 2013 issue of ‘Infusion Magazine’; READ MAGAZINE where he elaborates about his introduction and timely emergence to the apex of the Jamaican music scene. Since its inception in 2005, Infusion has set the standard in producing creative events in the United Arab Emirates (U.A.E). 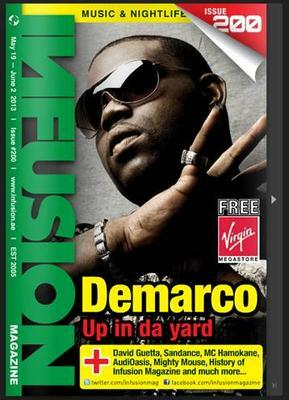 200 issues and 7 year later, Infusion Magazine is now the voice of Dubai’s entertainment industry and continues to help with its definition. With a planned performance on May 31st at the Domeland Area, Dubai, an elated Demarco says he is pleased with the feature and hails the accomplishment as another milestone for the local genre. This after bringing down the packed Hickory House in Victoria Park, Canada over the weekend with a scintillating hour-long performance. The entertainer will now turn his attention to Georgia for the Atlanta Caribbean Unity Festival on Sunday, May 26th alongside Soca stars Rupee and Kerwin Dubois. Locally, Demarco has released a new street anthem titled ‘Badman World’ on the Jaycrazie Records imprint while his soca influenced ‘Continue Whine’ steadily climbs the FIWI Choice and HYPE-TV video charts.